This connector is a single-row, 40-pin, straight male header strip that can be broken into smaller strips. Both sides of the strip are long, allowing for unique connections that cannot be made with standard male header strips. 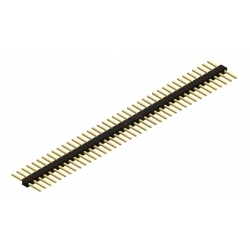 For example, this header can be used as a female-to-male adapter, and both sides are compatible with wire wrap.